The recently created Central Real Estate Partners has acquired Village Real Estate Services, the latest move in what has become a fast-changing local residential real estate sector. 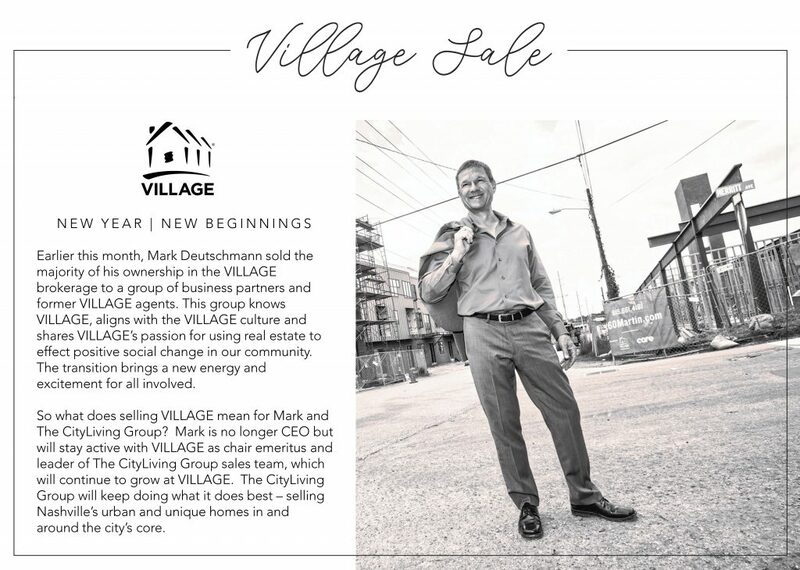 According to a release, Village founder and CEO Mark Deutschmann has sold a major percentage of his ownership in the business. Specific financial terms of the deal are not being disclosed. The entity will operate with the Village moniker, and Deutschmann will serve as chairman emeritus and as leader of his City Living Group sales and marketing team. In addition, veteran real estate industry officials Hunter Connelly and Aaron White (Connelly started Core Development with Deutschmann in 2003) of Evergreen Real Estate, are members of the new Village ownership group. Connelly and Zach Goodyear, formerly of Village, will serve as CEO and principal broker, respectively, of the new ownership structure. Deutschmann also founded The Village Fund (which has invested more than $2.2 million in the city, according to the company website) and Core Development (which focuses on mixed-use projects in emerging urban districts). He continues as CEO of Core and Village Holdings, which are separate entities not part of the deal. The deal comes shortly after a significant number of area residential real estate agents and brokers collectively left their respective employers to create Central Real Estate Partners (read here). A key core of that group departed from Parks Realty’s Gulch office. These include Goodyear, Scott Evans and Brian Stoltzfus. Goodyear, Evans and Stoltzfus left Village in 2012 to help spearhead the re-branding of Parks (formerly Bob Parks Realty) and create an urban presence for the then-suburban-focused company. Via a Gulch office, the trio grew the entity to more than 60 full-time agents. Relatedly, Goodyear, Evans and Stoltzfus oversaw high-profile listings such as Twelve|Twelve in The Gulch, among others. The release does not not how many of those agents might join the new ownership group at the reinvented Village. Deutschmann, who started Village in 1996, ranks among the most senior officials within the city’s residential real estate industry. He has grown the company to more than 300 agents and staff with six neighborhood offices. This is the latest such move locally. Last month, Nashville-based residential real estate company Christianson Patterson Courtney & Associates announced it would merge with Zeitlin Sotheby’s International Realty (read here). And in November, New York-based residential real estate firm Compass announced its entrance in the Nashville market, adding agents from Synergy, Village, Zeitlin Sotheby’s, Parks and Chateau Properties (read here).